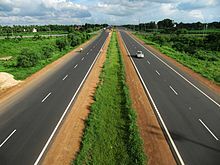 This article is about a route of the Asian Highway Network. For the single engine helicopter gunship, see AH-1 Cobra. For the dual engine helicopter gunship, see AH-1 SuperCobra. For other uses, see AH-1. 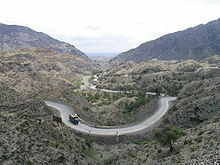 Asian Highway 1 (AH1) is the longest route of the Asian Highway Network, running 20,557 km (12,774 mi) from Tokyo, Japan via Korea, China, Southeast Asia, Bangladesh, India, Pakistan, Afghanistan and Iran to the border between Turkey and Bulgaria west of Istanbul where it joins end-on with European route E80. 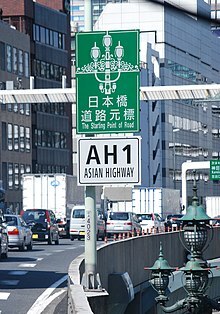 AH1 at Nihonbashi, Tokyo, the "zero milepost" for measuring highway distances to Tokyo. Camellia Line ferry to Busan, South Korea. From Fukuoka, the Japan–Korea Undersea Tunnel has been proposed to provide a fixed crossing. The section in South Korea mainly follows the Gyeongbu Expressway. The Highway Boundary of South and North Korea. in Turkey. The E80 continues in the E-road network from the border station at Kapitan Andreevo/Kapıkule to Sofia in Bulgaria, followed by E80 highways to Niš, Pristina, Dubrovnik, Pescara, Rome, Genoa, Nice, Toulouse, Burgos, Valladolid, Salamanca and finally Lisbon on the Atlantic Ocean. Wikimedia Commons has media related to AH1. ^ アジアハイウェイ標識の設置場所 (in Japanese). MLIT. Retrieved December 5, 2011. ^ Economic and Social Commission for Asia and the Pacific,2003 Asian Highway Handbook Archived 2012-04-14 at the Wayback Machine, 2003, page 54 shows an aerial photo of the Yokohama Aoba Interchange, placing AH1 clearly on the Tomei Expressway rather than the other Tokyo-Nagoya expressway, the Chūō Expressway. ^ Regional Road Connectivity Bangladesh Perspective (PDF). RHD. Retrieved February 19, 2017. ^ "Asian Highway Route Map" (PDF). ESCAP. Retrieved February 19, 2017.